If you are into pool parties, you must know what is an essential for the occasion: a floating pool speaker. Yet, this product can be very versatile. 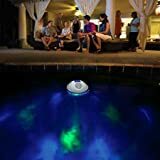 For those who are into relaxing in water or finding some zen while soaking in your little swimming pool or bath tub at the end of the day, they also find a floating pool speaker a much-loved item. Are you also overdue for a Bluetooth floating pool speaker that is just right for your budget and your needs? We’ve got your back. Our team has recently scoured the Internet for some of the leading models and we have chosen the top 10 amongst all. Hence, here’s are the top 10 best Bluetooth floating pool speakers designed for a variety of purpose. For the number 10 baby, we have here a top-rated pick from Atlec Lansing. This little, powerful floating pool speaker comes in 6 lovely colors such as blue, purple, red, black, pink, etc. It is encased with rubber for added durability. And, it is capable of playing sound almost 1000 feet away via Bluetooth connectivity. 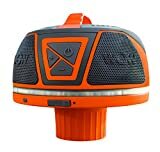 To liven the outdoors, the speaker is deal for playing not just by/in the pool but also when you are going biking, boating or hiking. And, without the doubt, the speaker is water-resistant. Pus, it is resistant to shock, sand and snow, too. It is light, and compact enough for you to easily take it along with you. It can play for 10 hours without needing to have its battery juiced up again. For an even more dynamic sound at your party. You can pair this speaker with 2 other speakers. Dance your feet off at the next pool party with Atlec Lansing. Up next, this best floating waterproof bluetooth speaker is made by Slitinto. Coming in blue, this speaker sure blends in with the pool well. In case you accidentally submerge the speaker into water, it can stand the water depths of up to 2 feet and half an hour. 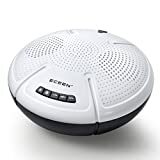 Featuring a suction cup, the speaker can be sticked to the wall of the pool for you to easily locate it. If you intend to use it inside home, you can always stick it to the counter, mirror, or just about any surface. Be noted that the suction cup can be removed. The speaker is equipped with 5W driver for superior performance. It is light and easy-to-carry yet beasty. It uses wireless to play music. Operating the item is also made easy thanks to its ability to connect with your phone or other devices. The longest distance it can work with is 33 feet. As of additional features, this baby has an FM radio, and microphone in it. So, it lets you pick up phone calls, too. For each full battery (which takes 3 hours to fully charge), you can enjoy 8 hours of entertainment. The LED light helps set the mood prepping you for the party or relax you according to different environment. If it notices inactivity lasting for 15 minutes, the speaker will shut off automatically to save battery. Per package, there are the speaker, charging cable, manual plus a 30-day warranty. Not many people know this brand, Laura Koncepto. This brand produces really great speakers. So, we think it’s about time to shed some light on this high quality speaker from them. This speaker is of course waterproof. It comes along with a smart case used for protecting your phone. This case is perfect for keeping extra cash or cards, too. The item is great for the pool as well as various outdoor activities. To power, you need to charge it for about 5 hours. And, that provides 4 to 6 hours of continuous music. Plus, in addition to being waterproof, it is anti-dust and anti-scratch as well. The suction cup attached lets you stick it to the wall or other surfaces. The cup can be removed with ease. There is a carrying clip for you to hang the speaker to your bag or other items. The speaker’s performance is of 5W. There is a speaker built in with the speaker as well. That enables you to pick phone calls in the shower or when swimming. But, most importantly, be noted that the item floats but please do not submerge it into water. What about a pool thermometer and a floating speaker all in 1 unit? If that sounds like what you prefer, check this pick out. The item features lovely LED lights. These lights constantly change according to the beat of the music. It features 3 modes that you can freely select. Thanks to the speaker being flip resistant, worry no more when you want to toss the speaker into the pool. That also gives you peace of mind when you need to go boating with this speaker, too. Its power is of 4 watts. The music played sounds superb. All in all, we think you’ll love it! ECEEN really impresses us with its sheer quality. The speaker is likewise ideal for the pool, beach, shower, and just about all kinds of outdoor sports. It can go into water for 3 feet for as long as 30 minutes without any fear of damage. It can power through 24 hours on water, so you’ll have more than enough time swimming a long with your favorite music by your side. The speaker is capable of providing clear and beautiful sounds as well. The bass is just as impressive. The power is of 5 watts. To control via phones or other devices, simply connect it to the device. Connecting should take no more than 5 seconds. The controls are on playing or pausing music, skipping tracks, and adjusting the volume. Be noted that there are buttons on the speaker for you to control these functions, too. There is a microphone built-in as well. This lets you pick up calls hands-free. Play time is about 5 hours long; with a distance (to your phone or other smart devices) of 100 to 120 feet. Enjoy music on water worry-free with Eceen. We also adore this pick from the brand called Game. This best pool speaker system is a speaker that is powered by a rechargeable battery that can blast music for 6 hours straight. Encased nicely, it is a water-resistant item. The Bluetooth range is about 60 feet long. Featuring a hanger, you can hang the speaker just about anywhere. Set up can be done in a snap, while pairing it to your phone is a breeze. There are lights to lift your mood, too. The lights make it a joy for kids to see as well. The sound is not top-notch, but it is certainly more than acceptable. Operating this speaker is very straight-forward, too. Make bath time fun with this baby. Another sought-after model is from WOW Sports. This Bluetooth floating pool speaker is well-made to withstand heavy duty use well. So, the item is great not just water but also for using when you are out doing outdoor activities. The depths of water it can withstand is 3 feet for about half an hour. As you can see, the speaker comes in a design that makes the user easy to hold it. It even fits in a cupholder. With such a price tag, you may question what are its special capabilities. Well, one of its best features is the super long-lasting battery. The battery can power through more than 50 hours. So, if you are away from home for quite some days, this speaker can still accompany you with some great music. As of sound, the sound is equipped is the Omnidirectional Hi-Fi one a long with a passive bass of 4 inches. The speaker also features LED lights for added visibility during the dark. If you are in the mood to splurge a little for a premium quality pool speaker, do check this option out. If you are a fan of sky blue color, check out this lovely pick from Skywi. The speaker has a rugged build a long with a very desirable quality. It comes with a hanger for you to hang it on the ceiling and carry it with ease. It floats on water as well. In addition to being waterproof, the speaker can withstand dust and shock, too. The Bluetooth connectivity distance is miles long. Indeed, the speaker can be paired with your smartphone as well. Pairing takes no more than 5 seconds. The built-in microphone allows you to pick up phone calls hands-free. It can withstand the water depth of 3 feet. The volume is fully adjustable. The power is of 5 watts. As of battery capability, it lasts 5 hour after each full battery charge. Be noted that the size of this speaker is fairly larger than most pool speakers on the market. To be specific, its size is 8.2 x 8.2 x 4.7 inches big. Liven up the great outdoors with this speaker from Game. The speaker is a high performing water-resistant speaker that uses Wi-Fi to blast music from any smart device source. It can play music as long as 8 hours and the lovely lights last about 12 hours. The Bluetooth range is 60 feet. Plus, the sound produced by the speaker is just awesome. It is compatible with both Apple and Android products. It is powered by no battery, but you need to charge it first before let it go to work. The speaker’s playtime is about 8 hours maximum. The equipped hanger lets you hook it to other things like your backpack while you are on-the-go. Best yet, the item is also backed by a 90-day warranty. Topping the list, Nuwa is what every music lover desires. This floating pool speaker from them is not only waterproof. It is also resistant to shock, dust and potential damages. If you accidentally drop the speaker into water, worry not as long as the speaker is submersed no deeper than 3 feet. It is powered by the power of 5 watts. The sound it blasts is as powerful as a boombox. The speaker can be paired to smart devices successfully in no more than 5 seconds. As of the speaker’s profile, it is light and compact. For the controls over the speaker, you can press play, pause, go backward/forward and adjust the volume. Thanks to the microphone built-in, the speaker allows you to answer calls, too. Its playtime is about 5 hours long, and the Bluetooth distance is about 120 feet. Ranked number 1 in our list, what do you have to worry about? Do check this baby from Nuwa out. Hook or Suction Cup: For the user’s convenience in keeping/locating the speaker where/when the music is played, some speakers come with a hook or a suction cup. With a hook, you can hang it to other items like your backpack or the ceiling. And, with a suction cup, you can stick the speaker to the pool’s wall, the shower’s wall or the kitchen counter. So, please consider if this is a must-have aspect for your pool speaker. Submersible Water Depth: Most pool speakers can be submersed into water for a certain time in a certain depth. Most can be submerged 3 feet under water and 30 minutes long. This can be a must-have factor because with a floating pool speaker, we tend to accidentally drop it into the water all the time. Durability: In addition to making speakers waterproof, some brands take the speaker even further. They make the speaker sand, splash, and damage proof. This can come in very useful. Battery and Hours of Playtime: Next, if you plan to play the music for longer hours, do get a speaker with a battery that lasts longer. That also means more hours of charging time. The more premium options can offer that. Built-in Microphone: It is a no brainer to know that with a built-in microphone, the speaker allows you to answer calls. If you find yourself needing to pick up calls a lot, consider this factor, too. When we party, we cannot rock the night without music. And, when it comes to pool parties, a floating speaker is needed in the pool for more fun. These speakers should be the high quality products, which are waterproof. 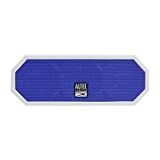 Therefore, to aid your selection for the best Bluetooth floating pool speakers, here are 10 choices of them that you can browse through. Firstly, let’s get to know one most innovative speakers that can be connected via Bluetooth to play music. This item can be connected to Bluetooth within the range of 33 feet, so it is convenient by not affecting your smartphone or laptop on the dry place. It is a kind of waterproof speaker and contains the power of 5 watts to power the speaker. You do not have to worry about the usage period because there is a 6 hours of run time, and it is easy to recharge the speaker’s battery. Moreover, the speaker can be changed within 7 colors during play time, so it is really good in nighttime. The full dimension of this product is 9.5 x 3.5 x 9.5 inches, and it is weighted to be 1 pound. Turn to the next product, you find out more criteria of the product you need. This wireless speaker can be far away from your connection of music in 100 feet through the Bluetooth. Thus, you really can enjoy the music without worrying about the connection. Furthermore, you can put this floating speaker to under water in 3 inches for 30 minutes with no problem. It needs the power source of 3 watts with the 4C batteries and 4AAA batteries. This product has an LED light for you enjoy in the nighttime and on/off switch on the item. Its mass is 1.95 pounds with the full size of 6.8 x 6.8 x 6.2 inches. Here is the Bluetooth speaker that makes your party and lifestylemore chilled. This item comes with a microphone. It will alert you about incoming calls and you can answer the phone from your bath or pool through the microphone. It can be connected to Apple, Samsung or smartphone that has Bluetooth functions, and it is safety to use under the rain, water and dust that can accompany you throughout the party. You can play the music with the speaker for 20 hours and far away from your device within 33 feet. Furthermore, you’ll get a 40-day refund with 18 months warranty for each purchase. The Bluetooth floating pool speaker has the size of 2.6 x 2.6 x 1.2 inches and its weight is 6.4 ounces. There is the product from the manufacturer of Cyboris. This is designed with the latest technology of TWNS function that could provide the stereo bass sound. It could play the high definition of your music with the high level sound. This item is really suitable for the beach, mountain, bath or car and any place because it is made to be waterproof and for indoor or outdoor usage. You can drop your speaker under the water 3 feet in 30 minutes and enjoy it for over 24 hours in your pool. It can be connected to your device within 100 feet and you can answer your phone through the wireless feature. They also recommend you to put your phone in higher ground and your speaker under the water to have the good quality sound. Its power is 5 watt with the size of 3.9 x 3.9 x 1.9 inches, and it is measured to be 1.1 pounds. Next, it is another Bluetooth speaker that could be under the water of 30 feet for 30 minutes without any problem. You will feel safe to use it in anyplace because this product is made to be resistant with sand, water and scratch. It is still good when it is dropped from 6 feet, and it is made of heavy-duty purpose. It is easy to be connected to any device that has Bluetooth. The Bluetooth range is within 30 feet and you can answer phone calls wirelessly. It has the same power as the above items with 5 watt and can be played for 6 hours. The quality of sound is still good even when the music is played in highest level sound, and it comes with 4 various colors of LED lights as well. Here, let’s take a look at another wireless speaker with an attractive outlook. This speaker is designed in a surfboard shape. 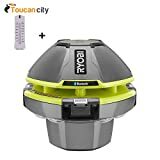 This item offers the high waterproof feature that you can put it under water of 1 meter for 30 minutes, and it has the Bluetooth range of 10 meters that can be connected to other devices such as smartphone, laptop or 3.5 mm audio jack. You will get high quality of sound without any annoyance. Plus, it also comes with a hook to hang to the wall, and its weight is 1 pound. You can enjoy the music up to 8 hours straight. This is the floating speaker that is from Lightahead manufacturer. It could give the good quality of the sound, and can be floated on the water to enjoy in your bath or pool. You will enjoy the music for 6 hours, and it can be recharged with your laptop or USB wall sockets for 4 hours. It can be connected to your devices such as cellphone, mp3 player or ipod within 30 meters without any block. And, be noted that the speaker has the size of 7 x 6 x 4 inches and the weight of 15.2 ounce. Move to another Bluetooth speaker with a surfboard shape. With this one, you can play the music up to 8 hours, and the speaker’s battery sure is rechargable. It is really good that you can control the volume by just taping the speaker, and it is easy to carry with because its full dimension is only 11.4 x 3.7 x 1.2 inches and its weight is only 11.68 ounces. You will get a 1 year warranty for every purchase. Here is the wireless speaker that also has the radio feature. You can listen to radio or your favorite music for 8 hours with the good quality of sound. This item can float on the water or be stuck on the wall. You can drop 3 feet under water for 30 minutes. The Bluetooth range is 33 feet. There is the LED light, and you can answer calls with this speakerphone hands-free. The last item on the list is the Bluetooth speaker that has a lot of holes to blast loud and beautiful music. This speaker can be submerged under water for 3 feet. Its Bluetooth connection range to other devices is 120 feet on the ground. You can enjoy the music for 5 hours straight. And, for your information, this Bluetooth floating pool speaker’s power is 5 watt. 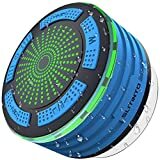 In short, these speakers highlighted above are not just for spicing up pool parties, but they can also be used in your bathroom while you are having a quality shower time. These speakers come in different sizes, and carry different features/qualities. So, feel free to pick one you love most. And, rest assured knowing any of the items on the list will never fail you.